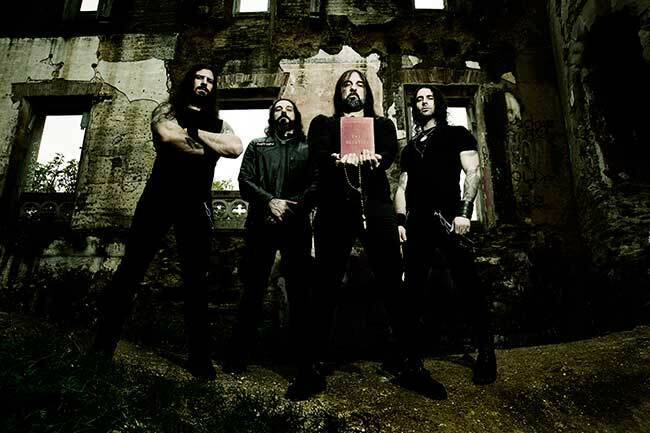 Greek metal titans Rotting Christ has been around since 1987, and in 2019 still feature founding members Sakis Tolis on guitar and vocals, his brother Themis Tolis is on drums with George Emmanuel on guitar and Van Ace on bass. The Heretics, their first album since 2016’s Rituals, was mixed by Jens Bogren and once again sees the band evolving, changing their sound while still remaining true to their roots. In The Name Of God opens the album with a mellow chant over which some voiceover work tells us how mankind will believe in any kind of deity to avoid being labelled a heretic, atheist or rebel. Immediately after this brief intro, the song kicks into overdrive, though that chanting stays in the background through much of the track. It’s an impressive and memorable track, a dark odyssey of sorts that’ll pull you in right from the start. Vetry Zlye doesn’t have quite the impact of the first track, it’s not as doomy and gothic sounding, but it gets pretty close in scope. The playing here, as it is on the entirety of the album, is tight and polished, allowing the band to deliver an impressive mix of traditional black metal mixed up with gothic, blackened thrash and strange operatic elements. All of this comes together here. Heaven And Hell And Fire follows suit, with Sakis’ vocals really shining here, running the gamut from guttural, demonic growling to rich, deep, baritone – this guy can sing, and this track really shows off his ability to do just that. Hallowed By Thy Name really stands out, it’s almost a dark, rhythmic chant of sorts more than a traditional metal track but it really seeps into your ears and into your mind and sets up a completely ominous mood that is hard to describe in text. Dark church music of a sort? More epic and operatic than that, complete with some heavy riffs and weird vocal effects that cause the track to shift gears every so often, delivering just over five-minutes of metallic insanity. This leads straight into Dies Irae, a shorter three-minute-and-forty-five-second track that is punchier and thrashier than the earlier tracks on the record are, while still retaining that weirdly beautiful tone that sounds like some sort of bastardized version of a Gregorian chant. It’s amazing how polished and progressive this band has become compared to their much angrier, unpolished earlier material, but we hear it again in I Believe, a four-minute track that opens with some words spoken in Greek that, well, I don’t understand. In fact, the entirety of the song is in Greek and the lyrics PDF accompanying the digital files sent for review do not translate those lyrics. Still, the track is a bit of a blaster, with drums just pummeling you while Sakis’ spoken word vocal delivery creates an appreciably dark mood. Fire God And Fear sees the band return to singing in English, and, over the course of just short of five-minutes, delivering something akin to a funeral dirge. Opening with a quote from Voltaire, it starts off calm and quiet but thirty-seconds into it shifts gears and plunges into a wonderfully intense goth-metal gallop. The vocal delivery here is intense but the it’s the guitar work that really stands out on this one, with Tolis and Emmanuel doing a fantastic job of playing in unison. Again, it’s the tone of the track that really makes it work, those eerie chanted chorus’ really sticking in your craw. The Voice Of Universe might be the gothiest track on the album, it’s chock full of more chanting and repetition than anything else included here, and it’s all the better for it. 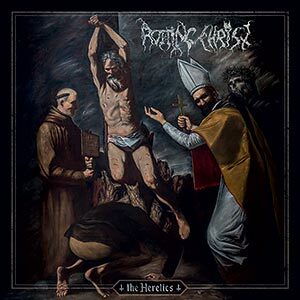 If the lead vocals are a bit limited in range, Rotting Christ is smart enough to play to Tholis’ strengths in this area. The New Messiah is a blasphemous three-minute mid-tempo mix of goth metal and black metal that ends with a pertinent quote from the book of Matthew. It isn’t the best song on the record, it’s a bit less orchestrally impressive and a bit less immersive but it shares many of the same qualities as the better tracks, mainly in the vocal and guitar playing department. The album closes off with The Raven, which is quite literally an adaptation of the poem written by none other than Edgar Allan Poe. Here, over a span of just over five-minutes, the band lays down a beautifully dark backdrop over which to read some of horrordom’s most beloved author’s best known words (with some original lyrical content thrown in for good measure). It’s an interesting and seriously cool way to end the record, with Sakis doing an extremely dramatic line delivery, bringing it close to but not ever quite overdoing it. It’s intense stuff, where clearly a lot of thought went into the lyrics with the band, quoting and pulling influence from many historical authors and free thinkers, taking aim at the institutions you’d expect them to – mainly the Roman Catholic Church. The production is very polished, the album sounds remarkably clean, but this doesn’t take away from the tone and the mood and the dark atmosphere that The Heretics absolutely benefits from. The fact that the band plays with as much skill as they do and that they can do this as tightly as they do, is also worth mentioning. These guys hit hard and hit with serious accuracy, and The Heretics, if not quite perfect, emerges as an early front runner as one of the most interesting and unique metal albums of the year.